Here is how you would store the records, let's ignore the column headers and just concentrate on the record rows and columns. So before we start coding we will go into how the arrays will store the values in each rows and columns. We are used to using single dimensional arrays that looks like this products, the problem with this way of defining the array is that there's no mechanism to access a specific row and column. 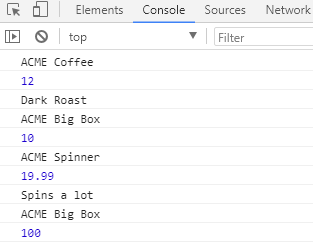 Now if we want to access the array on row 2 and column 1 which has the value of "ACME Spinner"
Most of the time we want to iterate through the arrays of arrays and get the all the values. So how would we do that? Well the answer is that we have to use a nested for loop to loop through the rows and columns like the code below. The preceding code uses the outer for loop to loop through the row, and uses the inner for loop to loop through the columns, by using the length as the exiting condition for both loops. The resulting output looks like the following in the browser console.